Blowhole Castle is a haunted castle in Wario: Master of Disguise. The ghosts that are found inside are harmless and intangible unless the spirit switches are turned on. However, turning on the spirit switches is necessary to make progress since certain platforms only turn solid when the switches are on. The castle is also inhabited by many dolphin creatures, whom are also ghosts. 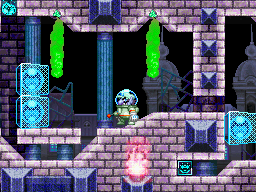 Throughout the castle are many white doors that disappear if Wario does not enter them quickly enough. Several of the castle's treasures are hidden behind these doors. When Dolphins Ruled the Earth! Wario arrives at Blowhole Castle after he destroys the Barfatronic Lavachomper. Count Cannoli aligns himself with the castle's ruler, Stuffy the 64th, in an attempt to force Wario to return Goodstyle. This page was last edited on March 22, 2019, at 02:54.